The teaching materials for the learning experience on “Ordinances and Covenants” are divided into two parts. Part 2 includes a practice exercise that will help students apply the doctrine they learned from the Doctrinal Mastery Core Document, along with the doctrinal mastery passage found in Doctrine and Covenants 84:20–22. This lesson also includes a cumulative review for all the doctrinal mastery passages students have studied so far. Note: You could teach the practice exercise and doctrinal mastery review in this lesson in a single class session or in two separate class sessions, sharing class time with your regular sequential scripture lesson from the Doctrine and Covenants. Review with students the three principles from the “Acquiring Spiritual Knowledge” section in the Doctrinal Mastery Core Document: act in faith, examine concepts and questions with an eternal perspective, and seek further understanding through divinely appointed sources. Note: You may want to adapt the following scenario according to your students’ experiences and needs. You may also want to substitute names that are more common where you live. Divide the class into small groups. Provide each group with the accompanying handout, and give each group time to work on it together. What concerns or misconceptions do you think Lauren may have about attending church and following Church teachings? What questions could you ask Lauren to better understand her perspective? How might a correct understanding of ordinances and covenants help Lauren? What blessings will she miss out on if she breaks the covenants she has made and stops taking the sacrament? Read the following statements from Elder D. Todd Christofferson and Elder David A. Bednar of the Quorum of the Twelve Apostles. Look for anything in these statements that could provide additional perspective for Lauren to consider about why God asks His children to do certain things. “If one believes that all roads lead to heaven or that there are no particular requirements for salvation, he or she will see no need for proclaiming the gospel or for ordinances and covenants in redeeming either the living or the dead. But we speak not just of immortality but also of eternal life, and for that the gospel path and gospel covenants are essential. And the Savior needs a church to make them available to all of God’s children—both the living and the dead” (D. Todd Christofferson, “Why the Church,” Ensign or Liahona, Nov. 2015, 110). “Ordinances received and honored with integrity are essential to obtaining the power of godliness and all of the blessings made available through the Savior’s Atonement” (David A. Bednar, “Always Retain a Remission of Your Sins,” Ensign or Liahona, May 2016, 60). How could the teachings of these two Apostles help Lauren understand the importance of keeping her covenants and coming to church? How might you use the doctrinal mastery passages in Doctrine and Covenants 84:20–22 and Doctrine and Covenants 82:10 to help Lauren understand why she should continue to participate in ordinances and keep her covenants? What invitation could you make to Lauren to encourage her to act in faith? 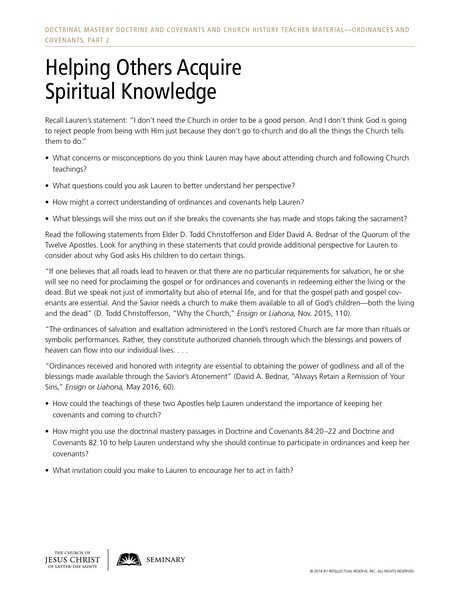 After students have had sufficient time to discuss the questions in the handout, invite each group to share with the class one idea they have for helping Lauren acquire spiritual knowledge. Encourage students to record in their class notebooks or study journals their thoughts about the experience and the answers their group found. Invite a student to read aloud the following statement by President Howard W. Hunter (1907–1995). Ask class members to listen for truths they have felt in their personal experiences with Doctrinal Mastery. “We want … students to have confidence in the strength and truths of the scriptures, confidence that their Heavenly Father is really speaking to them through the scriptures, and confidence that they can turn to the scriptures and find answers to their problems and their prayers” (Howard W. Hunter, Teachings of Presidents of the Church: Howard W. Hunter, , 282). How has Doctrinal Mastery helped you experience the truth of President Hunter’s words? In what ways have your confidence and understanding of the doctrinal topics increased? Explain that by consistently and diligently practicing and using the key statements of doctrine and the doctrinal mastery scripture passages, our understanding and confidence in these truths will continue to increase. Instruct each student to randomly select a strip of paper with a doctrinal mastery scripture reference written on it. Students should then locate the key statement of doctrine in their copies of the Doctrinal Mastery Core Document that is associated with the doctrinal mastery scripture passage on the strip of paper. After students have found their key statement of doctrine, invite them to prepare a 2- to 3-minute seminary devotional teaching the truths of these doctrines. Students should use the doctrinal mastery passage they selected and its accompanying key statement of doctrine as their primary sources. (If possible, you may want to invite students to use their mobile devices to search LDS.org or the Gospel Library app for articles and other materials that could help them teach these key statements of doctrine and scripture passages.) Encourage students to include an invitation or challenge for their peers to apply in their lives as a part of each devotional. Give students time to study and prepare, and encourage them to record their thoughts in their scripture journals or study notebooks. As time permits, you might invite a student to present his or her devotional as an example for the class. You could also pass a calendar around the class so students can sign up for a date to present their devotional during a class session.